Druk Expeditions is a boutique tour agency, which focuses on sharing its vast local experience of Himalayan regions and countries. We, like you, value meaningful journeys to lands that open the heart and deepen understandings. Based in the heart of New Delhi, India, Druk Expeditions is an amazing team of people, situated in even the most remote areas, who can offer you, unique and customizable trips to places such as Bhutan, Ladakh, Zanskar, Nepal, Tibet and most of India’s more interesting destinations like Kerala, the Golden Triangle, and the Buddhist circuit. We are dedicated to offering our guests a safe and unforgettable experience. To do this we must be trustworthy, efficient, and offer the most comfortable available for your budget. Our personalized service creates customized itineraries that meet each person or group’s particular requirements. 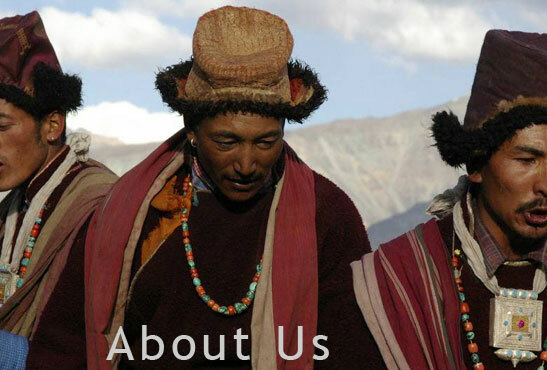 Druk Expeditions has always had a spirit and soul at its heart. Its first founder, some 14 years ago now, was the late His Holiness Ngawang Jigme, the 9th Shabdrung of Bhutan. His diamond like spirit is carried at the heart of our agency to this day. With so many wonderful places to see and experience we recommend you take a look through our destinations guide and our sample Druk Tours. Then contact us to talk further. We can personally customize a trip that meets your needs and interests. Born in U Tsang Tibet in a small farming village, Dhargyal sometimes has to pinch himself to realize how far he has travelled in his life. As a boy Dhargyal lived on the highest plateau of the world – he played amidst long barley stems, and with yaks and cows, and most he remembers the many occasions of celebration where family and community came together to sing, dance, play archery and have horse races. As a boy he says, he felt so clearly how each family and community member, held a strong commitment and respect to their inner spiritual life - this, he carries with him wherever he travels. Now, Dhargyal lives on the hot plain of India in one of the busiest cities of the world! Yet it is here that his strong, active and independent spirit has come to shine through. In India, he was, at first, cared for by his grandfather, a very learned Tibetan medicine doctor – a personal physician to His Holiness Dalai Lama. After the passing of his grandfather, he and the other 9 relatives who were watched over by him, were all taken care of by Tibetan Children’s Village in Dharamsala and Gopalpur. 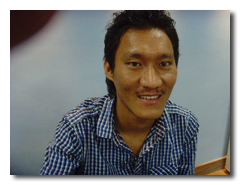 As Dhargyal loves to cook he entered the food and beverage industry. Having learnt Indian, Chinese and many other styles, his personal favourites remain Tibetan momos and can you imagine – Japanese cuisine! Dhargyal can and has cooked delicious food anywhere and everywhere – he looks for good ingredients and is creative and talented - skills good to have on any journey! Apart from travelling from the highest land to the low plains and loving the adventure of it all, Dhargyal loves sports and active activities – soccer, basketball, swimming and cricket, trekking and even gardening. Like everyone on our Druk team Dhargyal is passionate about his home and what its ancient wisdoms and culture have to teach us in this modern age. He values sharing this and he himself is a calm, steady, joyous and respectful person to have on our team. Lauren Galvin, also known as Konchok Chokyi, has been living on and off in the Zanskar region of Ladakh since 2006. After her first trip to Zanskar as a volunteer English teacher at Khachodling nunnery, Lauren decided she wasn’t ready to leave the nuns after only 3 months. Instead, Lauren took a leave from her studies at Smith College, where she was studying philosophy, and remained in India for the next two years. She has spent every summer since 2006 and one very long winter in Zanskar, when roads close and communication with the outside world is nearly impossible. Since then, Lauren has become fluent in Zanskari, and has recently begun studying colloquial and classical Tibetan in order to read and translate Buddhist texts. 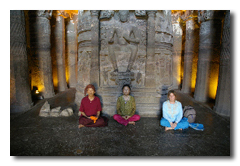 Lauren has lived closely with the Buddhist nuns in the area and acts as field officer for the NGO - Gaden Relief. Lauren is committed to improving the living conditions of nuns and lay women in Zanskar. She is also working on research projects that include oral histories of nuns and maternal health. Lauren enjoys trekking in the mountains, learning Buddhist texts and mediation, infusing Zanskari food with new ingredients and flavours, and learning about self-sufficiency techniques and appropriate technology such as passive solar building. She is a student of Khandro Thrinlay Chodon, the religious head of Khachodling nunnery in Zanskar, and the nunnery that she considers her home. 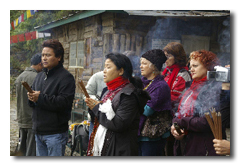 She continues to serve Khandro-la and assist with the Khachodling projects especially in Zanskar.